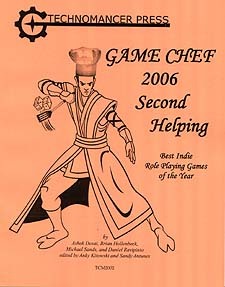 A handful of ingredients, one week, and the best indie game designers out there - the Game Chef 2006 contest (up for a Diana Jones Award) creates the tastiest games, and we're publishing the winners! Vol. II features the runners-up, "Liquid Crystal", "Time Traitor", "Three Dooms", and "The Glass Bead Game" - four complete games in one book! As a bonus, all profits will go to the "Child's Play" charity - so enjoy some hot indie games and benefit the world, all in one go!